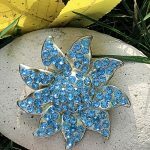 This is a gorgeous vintage blue starfish brooch. This piece of rhinestone jewelry is in very good condition. The blue rhinestones are set on a silver-hued metal base. Brooches are always great accessories to have. They can come in handy when you need a stylish way to pin something together. You can use brooches to accent your look. Traditionally brooches are worn over the bust; but you can use a brooch for any number of styling purposes and just about anywhere you choose. 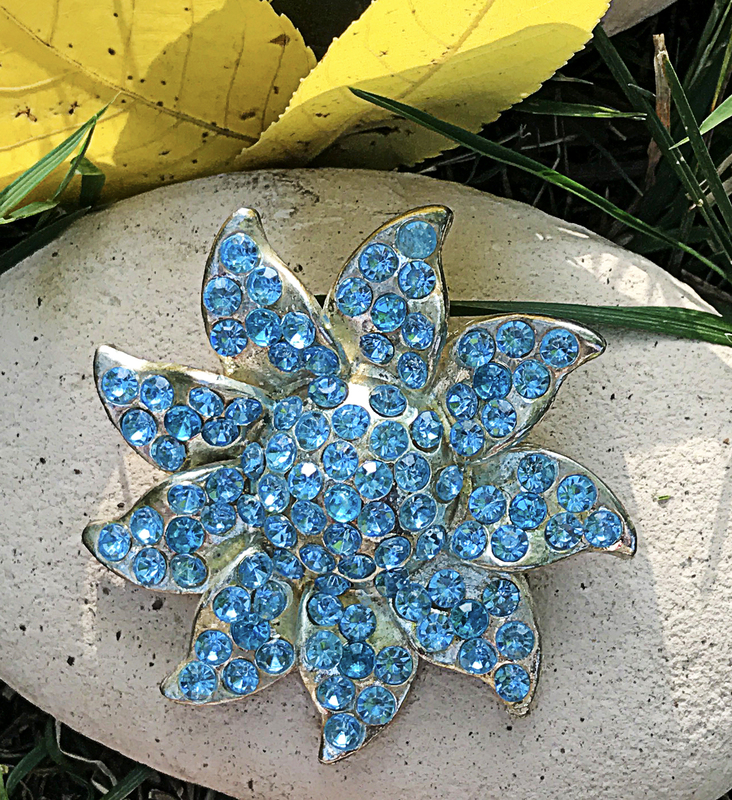 This gorgeous vintage blue starfish brooch can be used to add a bit of flair to your casual looks. 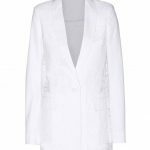 It can also be used to accessorize your formal looks. 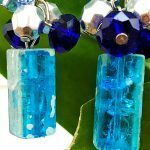 It is a versatile piece of jewelry that will work regardless of the season. If you’re wearing a blouse like the one above for example, a blouse with a stylish ruffle neck that makes it’s own neck statement and doesn’t really need a necklace, but you still want to accessorize, this brooch would be a perfect choice for that. 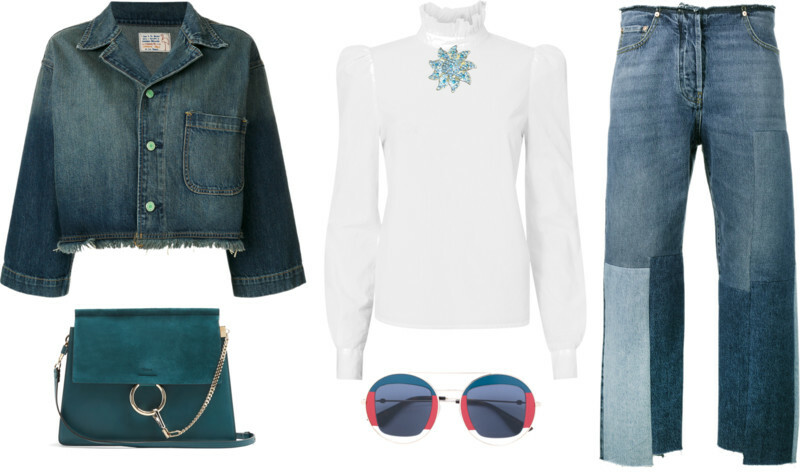 An outfit like the one above allows you to have the perfect mix of casual and dressy. Or you could clip the brooch to your denim jacket pocket, or if you date to be different you could clip it to your jeans in which ever place you choose. There are no rules when it comes to fashion. Or maybe there are rules, but rules were meant to be broken. 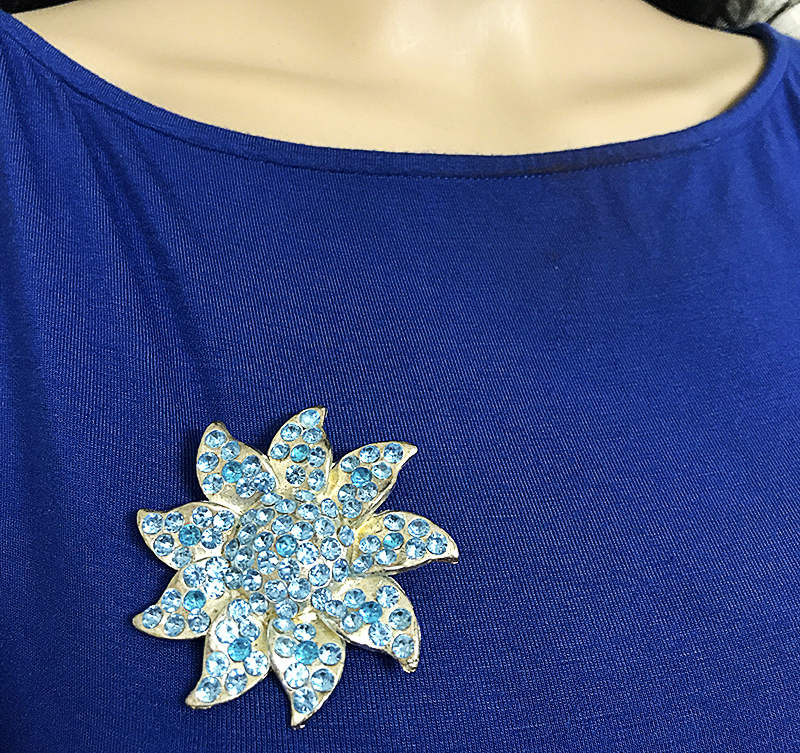 Add this blue starfish brooch to your rhinestone jewelry collection. The brooch is in good condition. All the rhinestone gems are present. 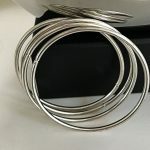 It comes from the jewelry collection of a former fashionista who possesses a high sense of style. The brooch measures 2 inches across in both directions and has a little weight to it, which is to say it is not flimsy. If you are a lover of rhinestone jewelry and starfish brooches, this vintage piece is a great piece to add to your starfish brooch and rhinestone jewelry collection.